Are you ready for my Aaron Sorkin Masterclass Review? In this post, I’m going to review the class, break down its contents for those curious to know more, share the highlights, and offer my (few) criticisms. I’d also like to take the time to explain who Aaron Sorkin is, why he is important, and provide the opportunity for everyone who is taking the class to get even more out of the experience. Simply put, Aaron Sorkin’s class will provide the fundamentals to make you a better writer. Thousands of people have already signed up to take this class. A class taught by a screenwriter of Sorkin’s caliber is an experience that you simply can’t find anywhere else. If you’re considering taking Aaron Sorkin’s MasterClass, click here to check it out. MasterClass is an online tutorial series wherein top writers, actors, athletes and musicians offer specialized courses in their craft. For a reasonable fee, MasterClass gives students unprecedented access to the wisdom and insights of an impressive array of teachers. Sorkin, for those who don’t know, is the Academy Award-winning screenwriter of such movies and TV series as The Social Network, Steve Jobs, The American President, Charlie Wilson’s War, The Newsroom and The West Wing, to name but a few. The West Wing earned nine Emmy awards for its debut season and went on to win 26 Emmy Awards in total. In 2011, Sorkin won an Academy Award, BAFTA Award, Writers Guild Award, and Broadcast Film Critics Association Award for “Best Adapted Screenplay” and a Golden Globe Award for “Best Screenplay – Motion Picture” for The Social Network. When I first started writing this Aaron Sorkin MasterClass review, I had thought the class would be most appropriate for beginning writers. However, the course has so much valuable information, it’s really for writers at all levels – even professionals. Sorkin offers an unforgettable lesson on fundamentals for beginners and more practical tips for advanced writers on how to pitch to studios and offers a first-hand look at the inner workings of a writer’s room. There simply isn’t anywhere else you can take a class like this with a writer of Aaron Sorkin’s stature. In addition to his solid, tried-and-true writing advice, Sorkin shares personal anecdotes from his decades in the business, and clear, memorable analogies on writing technique. Sorkin’s MasterClass is divided into 35 lessons that last approximately 5 hours, and features a 38-page printable PDF workbook for students to follow along. According to the MasterClass workbook, it’s recommended for students to spread out the lessons over the course of 6 weeks, though students are also allowed to go at their own pace. The lessons cover the fundamentals of screenwriting, including intention and obstacle, developing characters, story rules, and story arcs, writing dialogue, and scene work. He also covers writing habits, how to tackle rewrites, and taking criticism. A large Facebook community where students can ask each other questions, interact with one another, and form writing groups (one might even go so far as to call it a Social Network). Sorkin opens his first lecture with the caveat that his style of writing and teaching may not be for everyone. And while Sorkin does have one of the most distinctive styles in Hollywood, he helps teach and encourage students to develop their own unique voice rather than emulate his. Sorkin isn’t so much interested in teaching students how to write like him as he is trying to explain the fundamental rules of writing great screenplays. Sorkin also opens the series by apologizing, explaining that he is much more articulate on paper than he is in person. In this regard, it seems that Sorkin has underestimated his own teaching ability. He is a very engaging teacher. What’s fascinating about Sorkin’s teaching style is that he doesn’t just write stories on the page, but teaches through stories as well; weaving in metaphors, anecdotes, and lessons from his own life into these lectures. The results are lessons that are almost as fascinating and fun to watch as his movies and TV shows. Some of the best features of Sorkin’s class are the breakdowns of his own work, showing students scenes from his movies or television shows followed by step-by-step deconstructions. Using scenes from movies such as Steve Jobs and The Social Network, Sorkin analyzes everything from character development to stakes to dialogue. It’s rare to get an illuminating play-by-play that perfectly describes a specific writing lesson, much less one taught by the writer himself. Students come away with a clear understanding of the principles of good writing. Towards the middle of the MasterClass, Sorkin holds a mock writers’ room, where he leads students in writing an alternate version of Season 5 of The West Wing (Sorkin left after the 4th season). This lesson is particularly beneficial as it provides insight into how to work with other writers (especially considering the fact that most writers are accustomed to writing alone), and how to listen to a showrunner. Sorkin encourages the students to pitch their story ideas while reminding them of some of the basic rules of writing for an existing TV drama: examining the “leave” of the season finale, remembering “where a show lives,” understanding characters’ intentions and obstacles and their web of relationships, and mapping out loose plot points that you can’t forget about. Sorkin also stages a table read for the writers’ own work and provides direct feedback to the students. In each case, he offers a lesson that is useful for other writers, too. In another workshop section, Sorkin has students pitch their TV scripts as if they were selling the show to studio executives and provides feedback as to how various studio executives might react. In one particularly fun reversal, Sorkin pitches his own idea for a TV show to students. It’s far from an exhaustive exploration of the art of pitching, but it’s certainly a worthwhile addition to the course. Overall, Sorkin approaches his lessons from a practical Hollywood perspective. Whereas most screenwriting classes will teach the bare fundamentals of writing, Sorkin also talks about strategies and tactics for how to handle studios and executives, and presents behind-the-scenes stories from movies such as The Social Network – my personal favorite – and The West Wing. The Next Best Option Is…. Read and/or watch Sorkin’s most memorable film and TV pilot projects and study them. Pair that with the essential guidebook for dramatic writing to which Sorkin frequently refers: Aristotle’s Poetics. Take a look at his recent Reddit AMA, which includes some of the same insights he shares in the course. Personal Stories. Sorkin’s numerous personal stories stand out. Some favorites include tales of his humble beginnings as a broke actor and bartender in New York; the creative back-and-forth over what drink Mark Zuckerberg drinks in a scene from The Social Network (a disagreement Sorkin lost); and the A-list story connected to the show idea he pitches to the students. Downloadable Workbook. The downloadable workbook features excellent writing exercises and links to additional content. For example, one exercise encourages students to adapt the first 10 pages of a script based on an existing short story, and links to a number of well-known public domain works to choose from. Interactive Exercises. The exercises also direct students to an online community of writers, making this MasterClass more than just a straight lecture; it also encourages growth by challenging writers to leave their comfort zones and apply what they have learned in the class into real world practices. Encouraging Words. In the group workshop with Corey Wright, after doing a read-through, getting notes and having a conversation about Wright’s late self-identification as a writer, Sorkin says, “You’re a writer. This is really good work.” Isn’t that what we all secretly hope to hear? At some point, the hope is to get to have someone of Sorkin’s stature and experience look at us and say, “You are worthy of being in the club.” It was cool for Corey to get that validation and we can see that resonate. I found the course overall to be inspiring and motivating. Mock Writer’s Room Is Soft. One of the biggest problems with the class is the reality that it’s being filmed, therefore it isn’t a completely accurate representation of a professional writer’s room. He’s very diplomatic, which works for the purposes of learning. However, the dynamics would be different in a writer’s room with other powerful writers and with the freedom of knowing that each word isn’t being recorded. For me, the lessons in the mock writers’ room also felt slow at times, and I wished we could see a roomful of writers under Sorkin’s direction firing at full speed. Community Forum Is Unwieldy. The absence of being in a physical classroom, paired with the fact that there are tens of thousands of people taking the class (3000+ in the Facebook group), means that the interactivity doesn’t really provide a custom experience, but that isn’t how the class is designed. The Facebook group is very supportive and active, but it is also very big and kind of overwhelming. I think it is terrific that some people in the group are taking leadership and starting their own sub-groups. In many ways, Sorkin’s MasterClass is reminiscent of a great graduate level screenwriting seminar. However, whereas most one-semester university classes cost literally thousands of dollars, Sorkin’s MasterClass is available for lifetime access for only $90. Though $90 might seem expensive for students inclined to learn by picking up a screenwriting book, Sorkin’s MasterClass offers many things that textbooks can’t. Sorkin’s style of delivery and use of metaphor, lessons on fundamentals, as well as critiques of students in the writers’ room is simply something that can’t be found anywhere else. Overall, Sorkin doesn’t reveal any magic shortcuts or easy formulas to writing a screenplay. What Sorkin does do is help guide students to the fundamentals that have helped him find success in his writing and career, and help students to develop their own unique voice. At one point during his MasterClass, Sorkin says “At the end of a scene, we have to be at least one step further than we were before” and indeed, students who venture to take this course will find that they will have made progress as writers after having taken this course. Will This Guarantee Me A Job In Hollywood? No, but I can tell you that as a former executive, if you do apply the fundamentals learned in this course to your own writing, your scripts will be better than 90% of the scripts that land on a production company’s desk. Will I Become A Better Writer After This Course? I believe so, but that depends on whether or not you do the exercises and apply the lessons. Again, Sorkin’s lessons are grounded in his experience as an enormously successful working screenwriter in Hollywood today and draw from the fundamentals of classic dramatic storytelling. Will Aaron Sorkin Read My Film Or TV Pitches? Probably not, however the online community is a good place to share your ideas and receive feedback from other dedicated aspiring writers. Yes. If you use this link to purchase the course, at no cost to you, I will be paid a small commission. I did not receive free access to the course, but paid for it myself. I would not have signed up to become an affiliate or written this Aaron Sorkin MasterClass review if I didn’t personally believe in the value of this course. I’ve shared my opinion, but I’d love to know what you think. What do you think of the class? Thanks for this review, your the first review link in Google so mad props for that! Even though I went to film school, for a LOT of money, I’m still very tempted to check this out as it’s Aaron Freaking Sorkin teaching screenwriting for only $90! The big question though: would it be a waste of time/money for someone who already has a strong grasp of the fundamentals of screenwriting and has written several features already? This is a fundamentals course, so I’m sure there will be sections of the course that will cover topics that you already know. However, even though I have taken lots of courses and read thousands of scripts, there were still concepts that were presented by Sorkin in a way that they clicked in for me in way they hadn’t before. I also think a review of fundamentals is a good thing because sometimes even though we know what is important, we aren’t actually doing it. Whether you decided to take it is up to you. If you do and you aren’t satisfied for any reason, you can get a full refund within 30 days. If you do take the course, I’d love to know what you think of it. Thanks for the review. I stumbled onto this “Masterclass” yesterday after it was popped up as an ad on YouTube. I have been debating taking it since then. I simply googled Arron Sorkin MC review and here you are. Thanks for taking the time to break it down. I think I’ll do it. Thanks, Chad. Let me know what you think after you take it. Is there any certificate at the end of the course??? No, this is not a certification class. I’ve read a number of very positive reviews about content but also one disappointed end user review about customer service issues. As a reviewer and end user who paid their own way did you have an opportunity to test any customer service aspect such as response time, working through issues (technical or content satisfaction), or refund? I wish more reviewers would give that part a test drive also. Thanks. Good question, Eric. Yes, I have emailed customer service with a couple questions and I received a response to each question within a day. I also ordered and asked for a refund for another MasterClass course to make sure that they issued refunds easily and promptly. I received my refund on the same day. Can any one answer me! Whether this master class can be accessed from India? Yes, this course should be accessible in India. If it isn’t, you can request a refund. I am more interested in writing for movies. I notices in the review you mentioned writing a TV scripts and wondered if this would be as beneficial for someone looking to get into film. Yes, I do think the course is valuable for film writers and especially for those who are starting out. Glad to hear the quiz was helpful to you, Samantha. Welcome to the Good in a Room family! So glad I took the course. Every time I watch a video I get something new. And I like his thought processes. “Characters are not real people. We just think they are cuz they look like us”. Love it and is so freeing to “birth and grow” characters any way we want. His course is about total creativity within Intention &Obstacle. I’m using Save the Cat for structure while maintaining the creative side with Sorkin. So far a really effective combination because they balance each other. Very glad to hear it, Joe. Thanks for sharing your experience. I purchased the MasterClass last week. FANTASTIC! Very insight ful and informative. Well worth the money!! Glad to hear it, Arthur! How much were you paid for this review, the “class” is really a joke. No actual assignments are graded by anyone let alone Aaron Sorkin. He got his money and ran. I appreciate a good scam as much as the next guy, but Masterclass really takes the cake. One of their newest classes is “how to play tennis” seriously? Watching a video is going to improve your backhand. I’m glad, as a fellow writer that you got paid for this “review” but journalistic integrity can’t be dead. Admit the “review” is bogus. MasterClass is not bogus and neither is this review. I found the class helpful, not only to get access to Sorkin (even in video form), but to see how he runs a writer’s room and experience his thought process. I understand that your expectations weren’t met. MasterClass offers full refunds for 30 days after purchase and I recommend you take advantage of that. What can I say about the kung fu master of screenwriting, Aaron Sorkin? I’m grateful to be living in a time when a person like myself can take a class so personal like ‘Masterclass’ at such an affordable price. Aaron meets you in your office or living room, or wherever you’ve set up shop, and at your convenience he teaches and you learn. It’s worth taking and the list is growing with other great teachers that have joined Masterclass. Thanks for your review. I have admired Sorkin as a writer that speaks truth to power. His intelligent and brilliant scripts are the types of scripts I hope to also write. I look forward to his class. Sure thing, Joe. I’ll be interested to know what you think after you take the class. 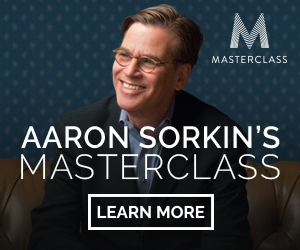 I’ve taken a few masterclasses…read a ton of screenwriting books, and even won a few awards at festivals…sorkin’s masterclass is a top 5 resource and so far the best masterclass. It’s hard to say it’s “better” than mamet’s but I prefer it. (I loved mamet’s book more than his class but I appreciate his tidbits on life). Can you go back and review one of the lessons (videos) again after you have already viewed it? How long in total is the class (lessons, hours/minutes etc.)? Thanks! Yes, you can watch as many times as you like. There are 35 lessons and it is approximately five hours of video. There are also supplemental materials that are excellent. I am sure this is going to be the most rookie question in the section. I am based out of India and have absolutely nothing to do with the film industry except that I have watched a good number of Hollywood and indie / regional movies (India produces most no. of films mostly crap but enough good ones as well). I am indeed amazed by the power of that medium. Anyway lately there has been this overwhelming desire that’s bothering me to create something on my own out of the vacuum. Right now, I think that desire is the only asset I have. Do you recommend this course to such a rookie? My aspiration is not Hollywood level but to write something for a good local language short / feature length film. Hard to know, Krish, but the MasterClass does have a return policy. You might consider getting the course – see if it’s a good fit for you. Hi Stephanie, There was a question in my head that couldn’t get past the pricing of that MasterClass was explaining and you finally answered it! I kept thinking about the cost of this is if I took a graduate course, as I am presently doing with a different discipline. I thought for sure I was misunderstanding the pricing! You confirmed a reply I recently received from them. It really is 90 per class without extra costs. The 180 per year is access to every class they offer. I just found it unbelievable! Another excellent benefit is that they don’t ask a bunch of personal questions to enroll! That in itself is worth the purchase!! Thanks so much, Ada. Enjoy the classes! One of the worst screenwriters ever. “Rules are what makes art beautiful.” —Aaron Sorkin. A good example of why Aaron is terrible at what he does, and another example of why the industry has so many problems. The industry needs more rebels and renegades. Not more narcissistic sycophants with a self promoting agenda. It would have to be an MGM executive to write a review like this, and not someone serious about writing. If you want any credibility at all, find someone who can be objective, and not someone interested in studio politics. Yes, the industry does need more rebels and renegades. That said, you may not like his work, but that doesn’t mean his course wouldn’t be helpful. My perspective is, there’s something to learn from anyone who has had a lot of projects made, and furthermore, when you start selling your work to studios, studio politics can become quite relevant. How many screenwriting awards you have?? Exactly. This was actually the very first Masterclass I took. That’s AWESOME if you possess the mind of Aaron Sorkin. The rest of us though, who don’t have the fondest clue how to write music, well, we may struggle a little. Yet, the theme of intention and obstacle is prominent throughout the class. They provide a substantial amount of material to review. I was introduced to William Goldmans book, “Adventures in the Screen Trade”. As well as the Aristotle’s Poetics for Screenwriters. All in all, it’s a good class, I just wouldn’t have expectations of writing like Sorkin afterwards. Speaking of…He mentions how some writers will writer another writers screenplay hoping their writing ability will osmosis over into them…Ya, I did that with “A Few Good Men”…The only thing I think happened was the early stages of carpal tunnel. Great article and props on the SEO work, considering you were at the top of a Google search. I currently work in marketing and SEO, so I know how that goes! Anyway, I mention SEO and marketing as I consider software and task management to be huge in my current profession (I was also a film major, so funny how things work out). Wondering if Aaron makes any recommendations to help keep writers on task, perform outlines, keep things centralized so they can stay focused. I’ve been interested in getting into screenwriting, but I feel like my mind is trained within the frameworks of a good software anymore. Hi Cody – Thanks for the comment! The most widely used screenwriting software is Final Draft which has a lot of extras to help you create outlines, etc. If you’re looking for something that will allow you to write without the financial commitment of Final Draft, you can read a blog I wrote about the subject HERE.